Neighborhood bistros, lively brasseries, intimate cafés, Michelin-starred restaurants, bars and terraces; they're all included in this Restaurant In Paris guide to dining and drinking. Choosing where to eat — and making the best choices — can be a bit confusing. But it's a good kind of confusing, if you know what we mean. But don't worry, here we're going to share our hard-earned experience (well…actually it was fun) and Insiders tips. Speaking of tips, here's another one. It's important to call the restaurant to confirm on the day of your reservation. (Or have your hotel concierge call for you). Many restaurants in Paris require this. If you don't confirm, you may lose your reservation. We've seen it happen! We've eaten at a lot of great restaurants in Paris and we love to talk about our experiences. 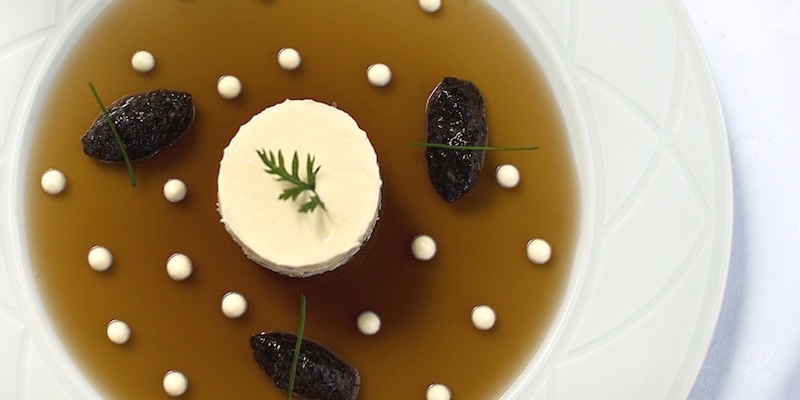 Our Best of Paris Restaurants are the special ones that have created culinary memories that endure the test of time. 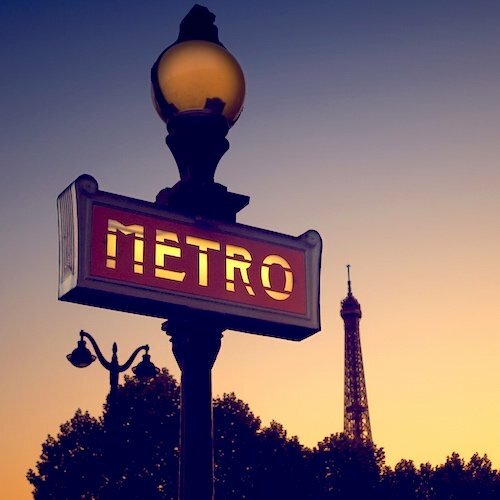 We like to think of them as the places we'd go if we had one last meal on Earth, the restaurants we urge friends and family to go when they are in Paris. The Michelin Red Guide to restaurants is the only guide book that matters to the top chefs of France. We know, we've asked them. During our visits to Paris, and especially for our new book about one-star Michelin restaurants in France, we've eaten at a fair number of restaurants that have been awarded the highest accolades by Michelin. Among those, we have a few favorites. We'll share the secrets. Wouldn't it be great to know how to find the best Paris restaurants that serve the classic French dishes and are filled with locals, not tourists? It turns out that the quest is easier than you might think. Start right here, with 10 tested insiders tips. 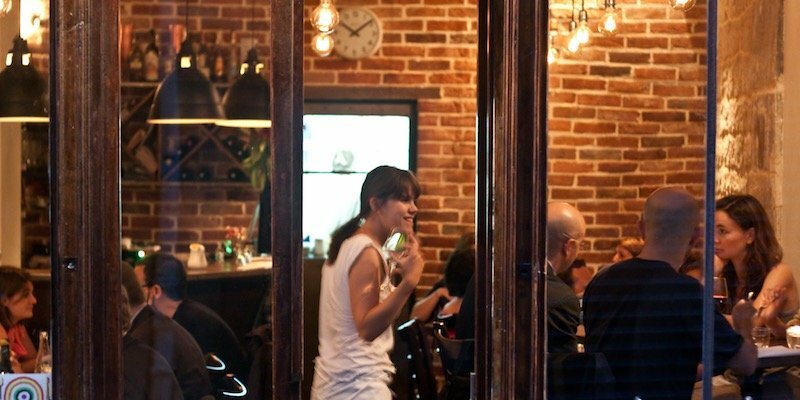 We'll help you find restaurants that feel like you've discovered them. There's no doubt about it, Paris is a food city. So it's always newsworthy when there are changes to the city's food scene — a new opening, a renovation of an historic restaurant, a change in chefs. From the Eiffel Tower to the Bourse de Commerce, here are the top restaurant stories in Paris this year. 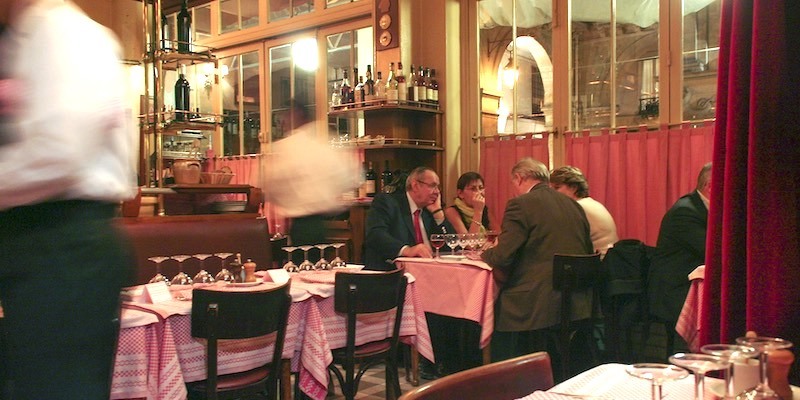 Bistros, it can be said, are at the very heart of Parisian dining. Some are smaller, family-run affairs, with the menus still scrawled on chalkboards. Others are elegant, with white linens and servers clad in black and white. But what they all have in common is classic, hearty bistro fare. Like cassoulets, foie gras, herring with waxy yellow potatoes, boeuf bourguignon, and creme brûlée. Eating at a great bistro is like a little vacation in itself, and creates memories that will stay with you. Here are six of the best memory makers. These dining establishments of Paris define the culinary landscape of the city and are a historical link to the past. Restaurants, bistros, brasseries & cafés in Paris have been around for centuries, reaching back to 1686 when Procope served their first bowl of French onion soup. 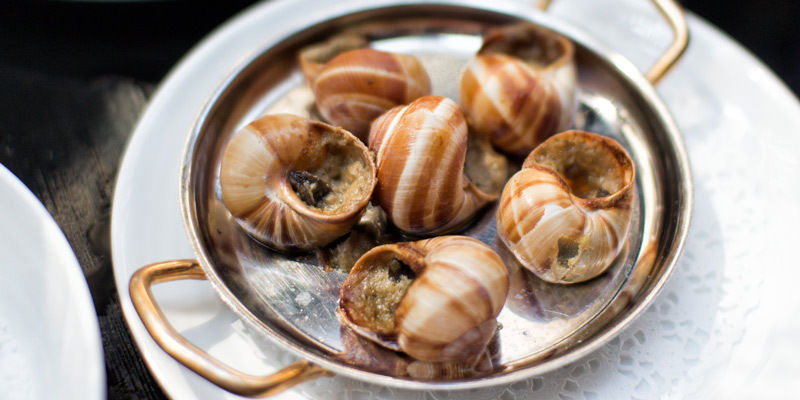 Today they remain the staple of French dining and are found in every quartier of the city. Read our guide to learn how to tell them apart, and to discover some of our favorites. 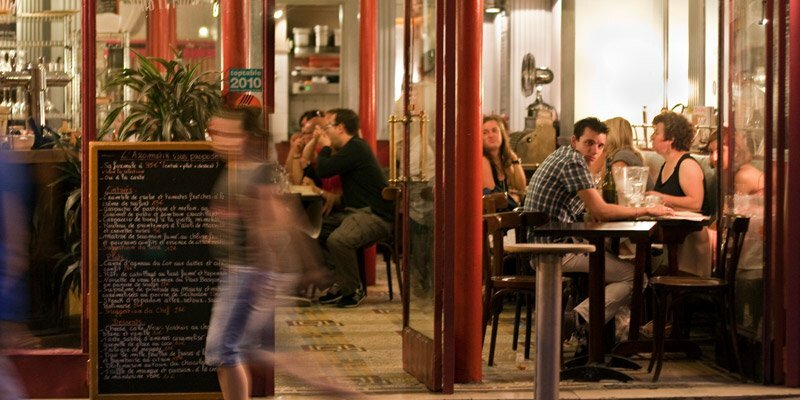 Brasseries in Paris are big, brightly lit, packed with Parisians, and serve meals all day long. The best ones have fascinating histories and still feature authentic period decoration. They're open all day long and — unlike Paris cafés and restaurants — you can order a meal at any time of day. 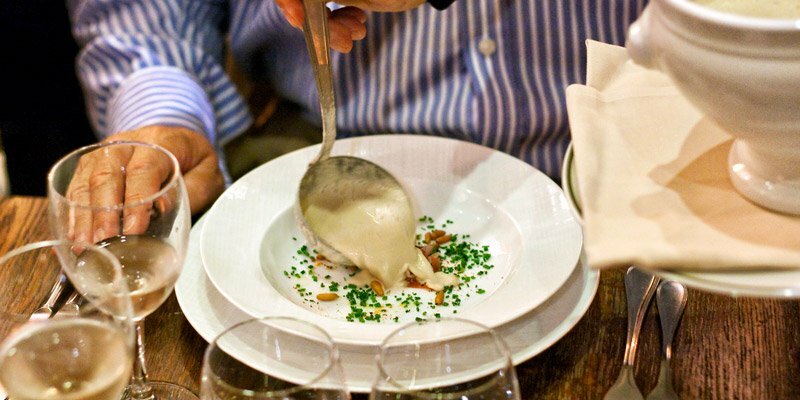 To experience Paris dining history, and to tuck in a hearty meal, check our reviews of the top six historic brassieres. Some of our most memorable restaurant experiences in Paris have been in those places where the chef/owner is in the kitchen. In this guide to Paris bistros, we explore a few stellar chef-run restaurants in the City of Food, some of which opened over twenty-five years ago, changing the city's culinary scene forever. They still offer gourmet meals at affordable prices. 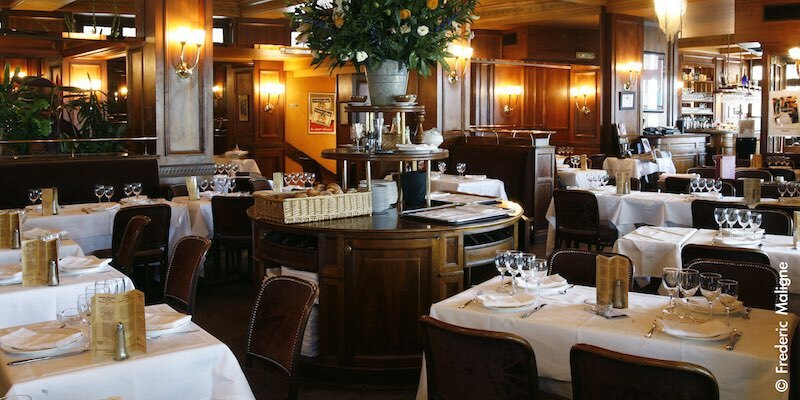 A leisurely long lunch or dinner in a top-rated Paris restaurant will give you a taste of the good life. 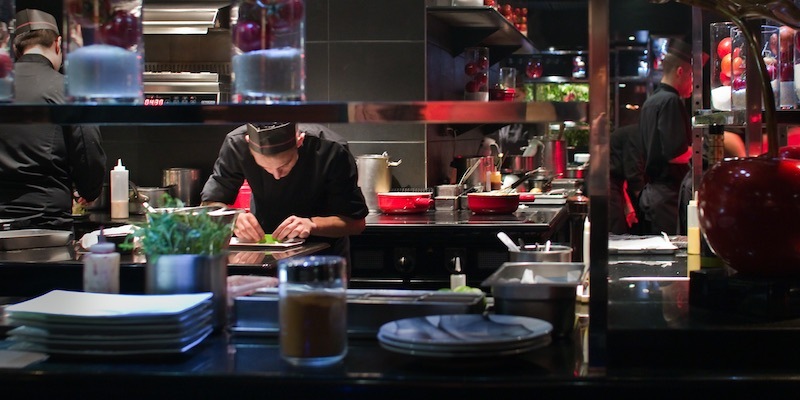 There will be a bevy of servers, all silently tending to your every culinary need. The setting will be opulent yet calming and the food will be inspirational. But, stuffy? Pas du tout. Not at all. We've always been struck by the care and attention the staff affords us and how everyone seems to be excited about serving such great food. What with all the current talk about New Paris, trendy restaurants, and vegan menus, it's somehow comforting to know that there still are a solid core of old-fashioned restaurants in Paris, serving up traditional fare. Think juicy escargots, roast leg of lamb, foie gras, duck confit, and ripe cheeses. Here are our top 10 picks for old-style restaurants. When we're hankering for traditional Paris, this is where we go. Paris is not just about restaurants and bistros. There's a lively bar scene as well and, over the past years, fun & funky cocktails have become a thing, with new cutting-edge bars serving them throughout the city. 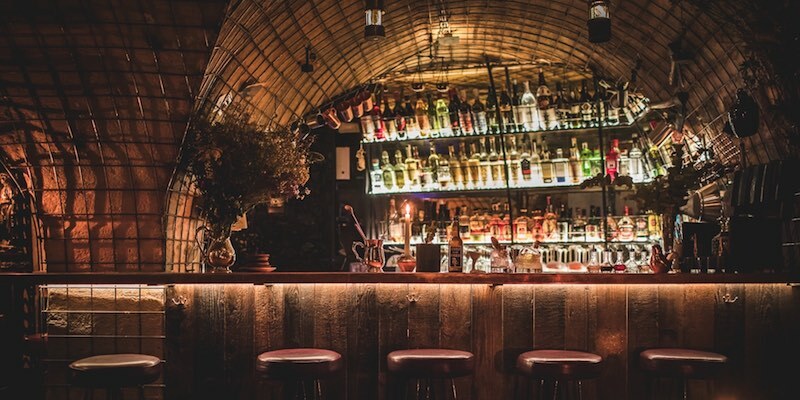 From the banks of the Seine to the top of the Marais, here are our picks of the best bars in Paris. 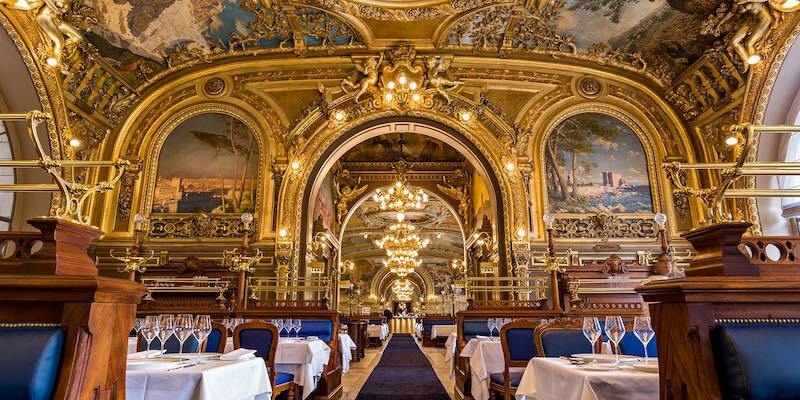 Named after a famous train of yesteryear that sped Parisians to the Cote d'Azur, restaurant Le Train Bleu is still found today at Gare de Lyon, and it's still just as magnificent as when it opened in 1901, following a recent multi-year renovation. 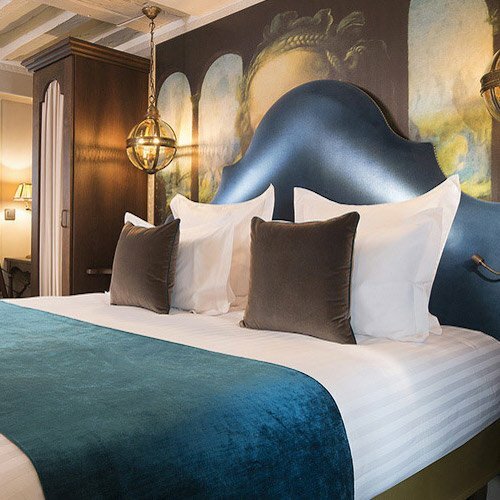 You're going to be amazed at the restored gilding, carved mouldings, chandeliers, paintings, and ceiling frescoes. 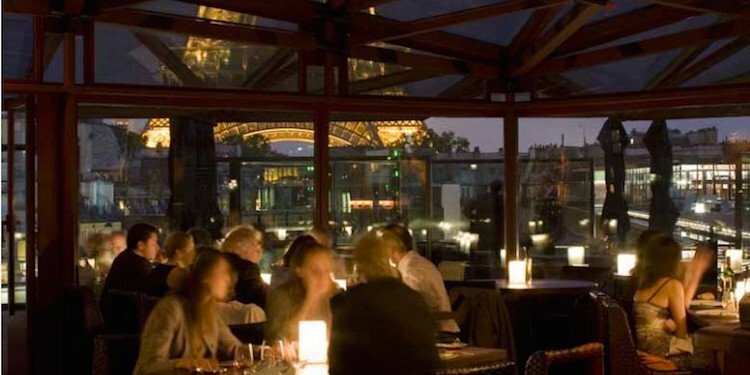 Let's take a virtual tour of the hottest Paris restaurant terraces — at least according to the Paris newspaper, Le Figaro. We've pared down Le Figaro's selection to our ten top favorites, found everywhere from the Palais Royal in the 1st Arrondissement, to St-Germain on the Left Bank, to way out in Belleville in the 20th. 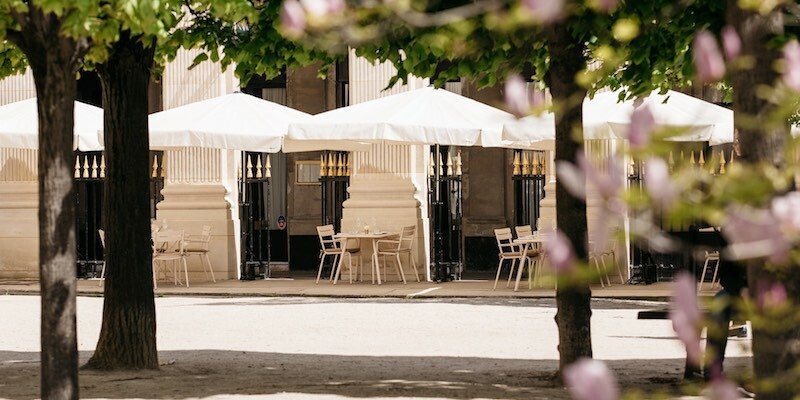 Summer dining in the city is best on these hot Paris terraces. Eat with the locals, outside where the sun is warm and the views are spectacular. 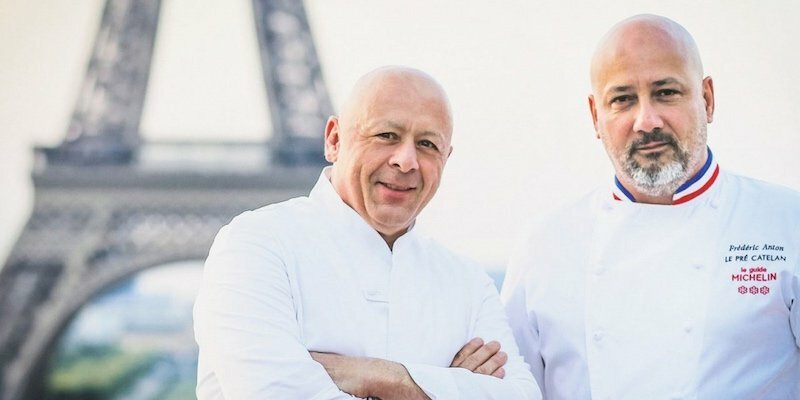 Paris has always had great bistros, but now it's official! 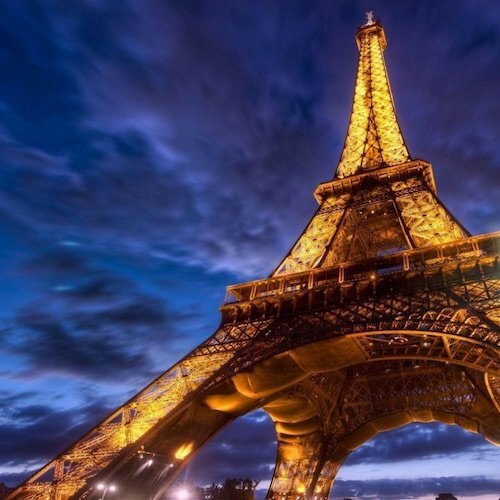 The Mayor's Office and the City of Paris recently recognized 100 stellar bistros that exemplify "the spirit of Paris" and "represent the diversity and richness of Parisian cuisine." We'll take you on a virtual tour of a selection of our personal favorite bistros, and then point you to the complete list. Shop, but don't drop. After trying on all those shoes at the Printemps department store it's time to take a break, refresh, and re-fuel at one of the cafes located inside the store. 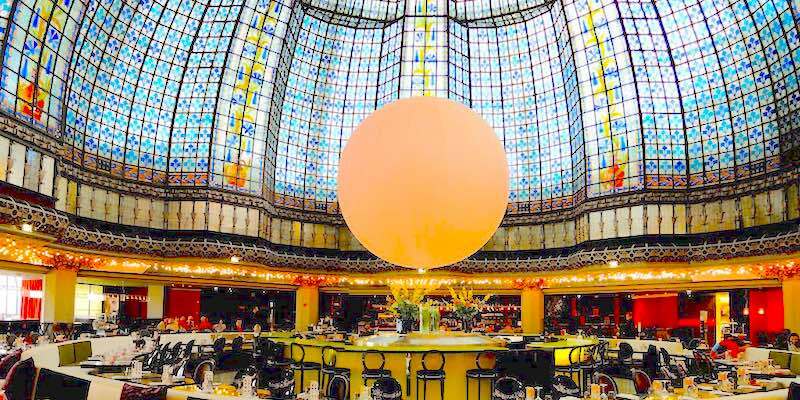 There's an outpost of Ladurée that may tempt you, or you may want to sit under Printemps famous Belle-Epoque dome at Brasserie Printemps. We take a look at seven dining options. 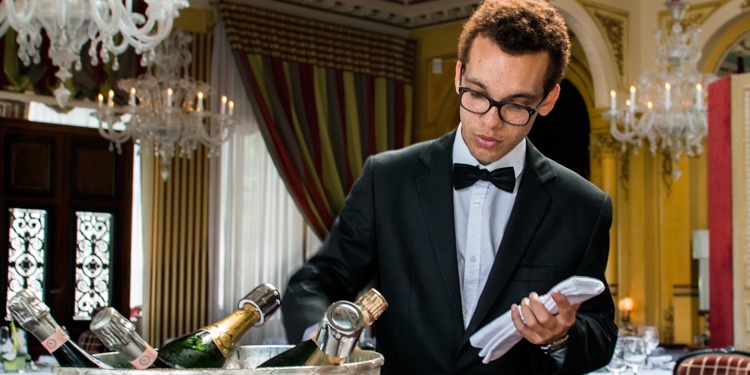 Waiters in restaurants in Paris do not fawn over their customers. Don't mistake this for poor service, it's just another fascinating cultural difference. 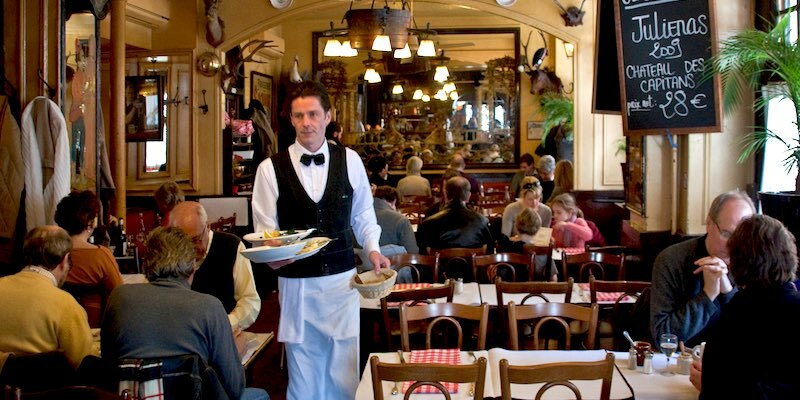 Most restaurants in Paris are small, so if you need the server just catch her eye — never snap your fingers. Space is tight in central Paris and you'll find that many restaurants use up every bit of their precious space. You may find yourself side-by-side with other diners. Enjoy yourself, but try not to poke them with your fork!